My daughter, Lanie, requested my graphic design skills to come up with another tattoo concept that blends a cultural mix of her parents’ heritage stemming from Japan, Okinawa and Mexico with a twist of Hawaii and Southern California to add to the beauty of an over the shoulder tattoo. Lanie is really interested in Asian influenced tattoos so that gave me a starting point. 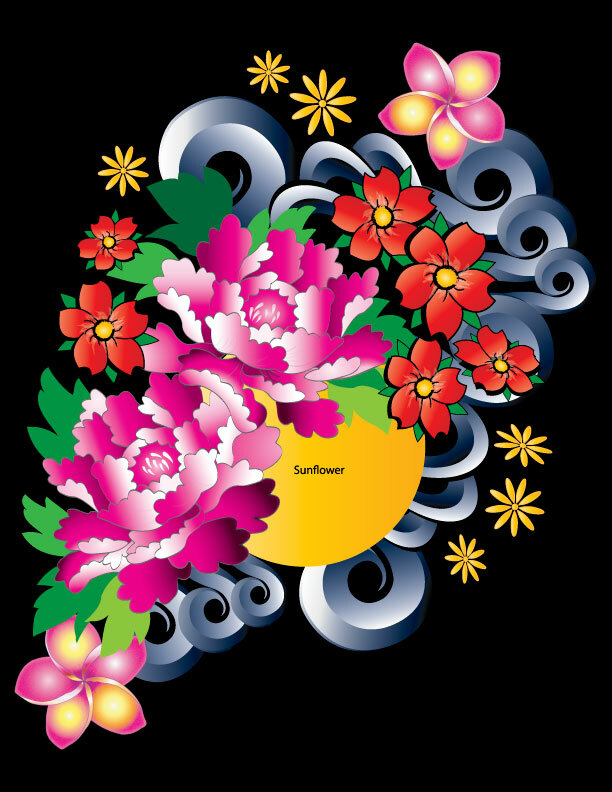 Our heritage is truly a marinade of ancestry so I decided to draft a floral concept that incorporates peonies, sunflowers and plumerias. 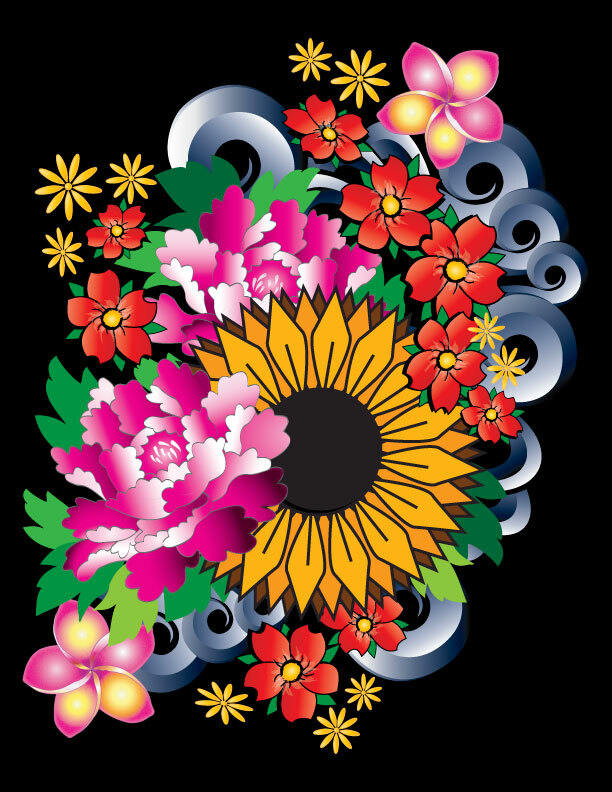 These flowers are native and used symbolically in both of our cultures. Since my husband and I were raised by the beaches of Hawaii and Southern California, the ocean waves are an important aspect to be built into the tattoo concept. Whoever is eventually hired as the tattoo artist, he/she will have to incorporate their artistry into Lane’s tattoo. Things may need to be re-align. This concept will be used only as a frame of reference for the tattoo artist. My expertise is in print and presentation which is a different realm of graphic design. I lay no claims to being a tattoo artist. These are working drafts in the starting phrase. Some of the floral elements are missing and details are not embellished. Things will change and elements/details will be added into the concept as I continue to work. Elements that will probably be added are violets to represent my husband’s mother because her name was Violet. The violet represents the month of February which happens to be my birth month. Peonies are depicted in textiles that are often seen on the beautiful kimonos of Japan. The peony is symbolic for beauty, wealth, prosperity and good fortune. Peonies are native to Asia. opening into the colors of my heart. Sunflowers are often seen in ceramics, paintings, metalwork, and wood craving in Mexico. 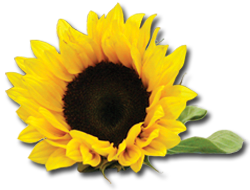 The sunflower is symbolic for faith, healing, light, warmth and growth. Sunflowers are native to Mexico. 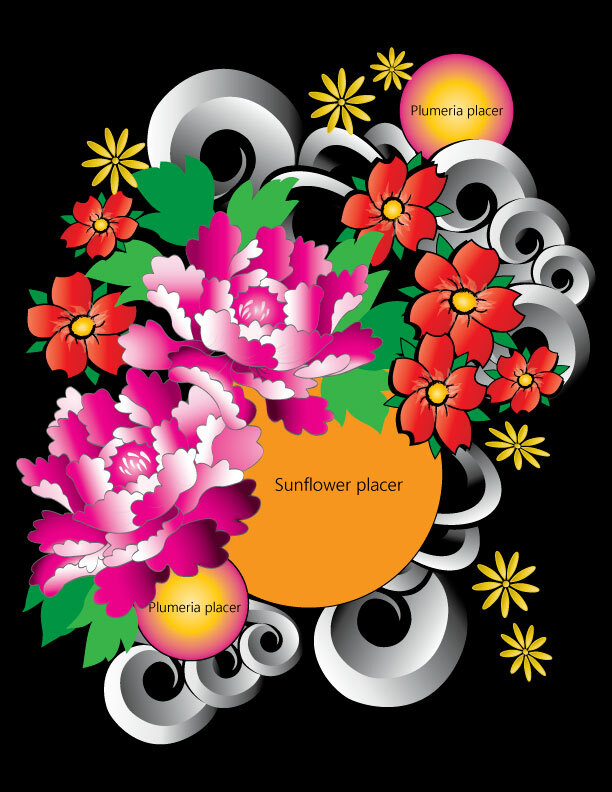 Plumerias are often use in garlands, or leis, perfumes , soaps, lotions, aromatherapy and candles. The plumeria is symbolic for life, birth, love, passion and immortality. Plumerias are native to Mexico, South America, India, and the Caribbean. Plumerias are not native to Hawaii. The Plumeria flower was brought to Hawaii in 1860 by a German botanist, but serves as an iconic symbol of Aloha! Violets are often used for their medicinal properties because it holds a plethora of vitamins. Violets are edible and used to decorate meals and desserts. The violet is symbolic for modesty, humility and signifies a love that is delicate. Violets are native to the Northern Hemisphere and are found in widely divergent areas such as Hawaii, Australasia, and the Andes. Keep a lookout as I will periodically update the concept’s progress until completion.